You can always pop a movie in the DVD player, make some popcorn and snuggle up with the whole family, and that’s a lot of fun. But at a place like Aegis on Madison, you can rent out an entire theater to enjoy with your family. This is sure to impress your kids, and lets you give them a luxury it’s just not that common to have anywhere. It can also make your parents feel like they’ve contributed to a fancy good time. Take a look around at the amenities your parents enjoy at their senior living community and see whether your kids would enjoy them. Are there gardens, perhaps, or a whole room dedicated to kicking back and relaxing? Speak to the staff and see whether you can reserve these rooms for the next time you and the kids are visiting. This can be a great way to make your time together special – and something your children won’t forget. If it’s appropriate in your parents’ senior living community, let your kids get their energy out by walking through some common spaces with you. If you have an outgoing daughter, she might love to meet other residents in the community (and the other residents would probably love to meet her), and taking a walk together is a great way to get some energy out for your son who just can’t seem to sit still. This is also a good opportunity to show your children where their grandparents live now, especially as they might be confused or miss grandma and grandpa’s house. There are plenty of new places to discover in your parents’ senior living community, and showing it off to your children can help them feel less awkward about visiting there. If your parents’ senior living community holds outings as part of its life enrichment programs, see whether you and your children would be permitted to come along. If you would be, this can be a great way for them to get to know what your parents do in their community, and to meet other residents who are now their grandparents’ neighbors. It also gets everyone outside and focused on another activity, which can be helpful for little ones who are overwhelmed by change or the sheer size of some assisted living communities. It’s also very important to maintain traditions that you’ve built with your children and parents, no matter where anyone lives. Have you always read books together? Is there a special blanket that’s just for your son to use at his grandparents’? Make sure to keep these things alive even as your living situation changes. This can help your kids feel more steady about your parents’ move and their life in a senior community. Follow these tips and find what works for your family in particular. 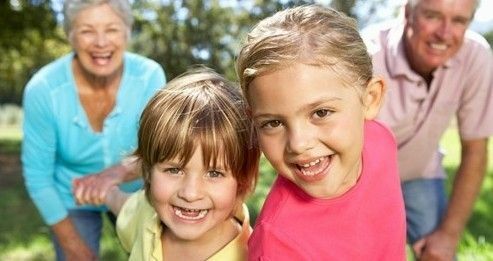 Before you know it, the kids might be begging to come spend time at your parent’s senior living community!